Come and enjoy the tranquility on our small holding. ​You'll want to stay for ever! The Nest Bed & Breakfast, situated just off the Friendly N6 Route to the Eastern Cape. When coming from Bloemfontein, we are approximately 5km before Aliwal North on the right hand side of the N6. Please also take note of directional tourism road signs that indicate our turn off. When coming from Aliwal North you will find us conveniently situated on the left hand side of the N6. We are approximately 5km outside Aliwal North on the N6 to Bloemfontein. The always visible tourism road signs will indicate when our turn off is near. The nest is situated on 21 hectares of Free State beauty. On arrival you are greeted by our vibrant garden filled with young plant life and a wonderful green lawn where you cannot help to relax. There is an abundance of birdlife, and the spacious grounds allows for relaxing walks and wonderful sunsets. Conference facilities, seating 100 people are available and caravans as well as tents are also welcome! There are separate ablution facilities for gents and ladies. Pets are welcome on request. Some of the rooms have a bath and shower, others only have showers. We have separate dining rooms for breakfast and dinner. The dining room for dinner also have a lounge. We serve a Full English and Continental Breakfast. Breakfast is served from 7am to 8am. Dinner must be arranged in advance. "Come and enjoy the tranquility on our small holding. 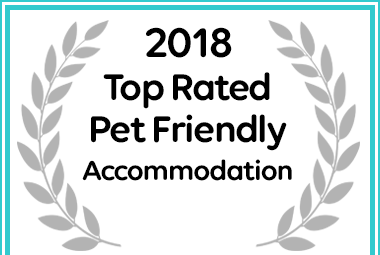 At The Nest Bed & Breakfast Lodge: named a Top Rated Pet Friendly Establishment by Afristay for 2018.